Some years ago at a lifting contest in England, a man was standing erect, having completed what he hoped would be an approved deadlift. The judges said no. It seems the barbell was behind the lifter’s legs, rather than in front of his legs. The bar was being held just beneath the lifter’s glutes, and even though the rules at that time for the deadlift did not make it clear that the bar had to be in front of the legs, the judges turned down the lift, saying in effect that a deadlift was not the same as a Hack lift, which was virtually what the lifter had just performed. 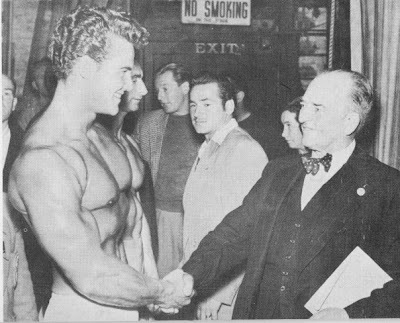 There were enough other lifters over the years in England who tried the behind the back deadlift that a rule clarification had to be announced in early 1954. From that time, deadlifts had to be attempted with the bar in front of the lifter’s legs. Through the years the deadlift has undergone some name, and some style changes. Early in the lift’s history it was known as ‘lifting sheer with two hands’ and ‘two hands alone’. Of course, there were one-handed versions of the deadlift; one style allowed the barbell to be across the lifter’s legs as in the two-handed version, and the other style allowed the lifter to straddle the barbell. Depending on era and location, the barbell (in both one and two-handed lifts) had to be raised six inches, or twelve inches off the floor, or had to be raised until the lifter was standing erect. Not an easy task if the lifter was a straddle the bar . . .
At least no one ever tried a one-handed deadlift with the barbell in back of his legs. So, historians became confused about which lifts were performed in the Camberwell or the non-Camberwell style. Even George Jowett was unsure how Goerner had deadlifted the famed 793.75 lb. record on October 29, 1920, and Jowett apparently passes this ignorance on to Bob Hoffman who also wondered what type of equipment was employed. Both Jowett and Hoffman indicated that special slotted discs may have been used, but Jowett acknowledges in print how high the weight came up off the floor – to an erect stance on Goerner’s part. It was also questions how high off the floor the barbell was when the deadlift began. But more on that in my next article . . . The point is: much confusion was current in those days – and lifting jealousy was not unknown. After all, a lifter standing erect with 300 lbs. in the deadlift hesitates to equate his lift with a lifter raising the same weight only 2 inches from the floor. Indeed, these days. any failed deadlifts go at least six inches before the lifter loses the struggle. A deadlift by any other name may still be a deadlift, but when style as well as language changes, then perhaps a deadlift is not a deadlift. But here in America when the A.C.W.L.A. (American Continental Weightlifting Association) wrote the rule for the deadlift there was an important difference. The bar, while ascending, could touch the legs ‘providing the bar has not actually rested upon, or against, the legs as a means of temporary support.’ Whatever were they referring to? In the summer of 1919 an Assault At Arms show was staged at the Surrey Masonic Hall in London. A lifting contest was held and Leonard Burner, heavyweight champion of Hampshire was participating, as was the heavyweight champion of Lincolnshire, J.H. Hatliff. Five lifts were contested, but something interesting, and pivotal in the history of the deadlift emerged. When Hatliff deadlifted, he employed a ‘see-saw’ up the thighs method which the other contestants and the judges had not seen before. In addition to the ‘see-sawing’ of the bar up to his thighs, Hatliff leaned back while so doing and gained an obvious leverage advantage. The judges passed the deadlift (but even with it Hatliff did not win). Another lifter in the contest, a an named Knight, sensing that the judges were somewhat uncertain on the lift they had just passed, said to himself (apparently) something along the lines of, ‘Well, if they will pass THAT, they will have to pass THIS’, and Knight pulled the barbell to his knees, then just above his knees, and then he ‘sat down’ – that is, he lowered his buttocks considerably while the barbell was a above his knees. While in that position, he ‘took a fresh grip and straightened his back. With this rest and renewed grip (R&R) he and improved leverage, Knight stood erect with the weight. The judges were now hinting for another line of work. They did not rule on Knight’s lift that day. So, Knight, and others, continued to use that R&R style in future contests. That was 1919. By 1932 when Ivy Russell’s contest with Tillie Tinmouth was being described, it was explained that Ivy’s 300 lb. deadlift was via the R&R method. That same year when she lifted at the reopening of the Camberwell Club, she deadlifted 322 lbs. This was on July 9th and I assume was also the R&R method, though one must also assume that members of the Camberwell Club preferred the ‘one clean, unbroken movement’ that earlier days had known. As late as 1953 matter s had not improved. 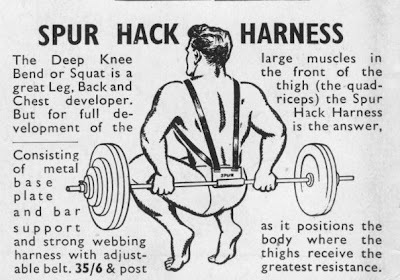 “Health & Strength” magazine reported concerning the deadlift, ‘Maybe it is not so popular at present . . .’ then continues, ‘Our role which permits the resting of the bar on the knees the gradual working of the weight up the thighs, etc, can make a limit attempt so drawn out that the spectators could be excused if they assert that it looks a straining and uninteresting effort’. You may be thinking, ‘No wonder some of those old guys could deadlift so much – I could do it too if I used the R&R method’. You are probably right. So why don’t you try it sixteen months from now, after all the steroids have left your body. And remember not to wrap any body parts, and don’t use a belt, and remember to keep those heels together. Yeah, no wonder those old guys could lift so much.